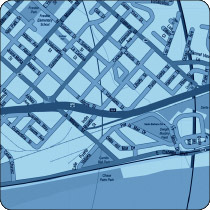 Maps.com utilizes a technology called GIS (Geographic Information System) to create our maps. Essentially GIS is a computerized method of storing, integrating, manipulating, analyzing and displaying data in a geographic format (maps). Not only does GIS technology aid in more efficient map creation, it also provides possibilities for strategic planning in advertising, sales, marketing, engineering, demographic analysis, and more. To create the best maps possible for our clients, Maps.com continually updates its hardware and software based on the needs of clients and the needs of the marketplace. We also work with many data providers to ensure that the most up-to-date content is incorporated into all projects. In addition, we create new data and catalog data for future use. Much of the geo-referenced data we use operates in real time and is the most up-to-date and accurate information available. Click here to learn more about the general types of maps we can create for you.